"Tasting of Paso Robles' Iconic Justin Vineyards"
$5.00 of the tasting fee will be credited back towards a purchase of any JUSTIN wines! Justin Winery is family owned and operated making estate grown and produced wines in the Central Coast region of Paso Robles. Back in 1981 Justin and Deborah Baldwin purchased 160 acres less than 10 miles from the Pacific Ocean of which 72 acres are planted with rich Burgundian-style Chardonnay and full-bodied Bordeaux grape varietals including Cabernet Sauvignon, Merlot and Cabernet Franc. 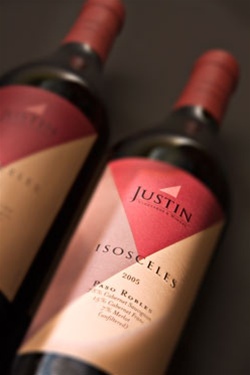 Justin's signature label, Isosceles, is a Bordeaux-style blend that demonstrates the potential greatness of the Paso Robles appellation. Its full fruit flavor and refined complexity make it a wine of great distinction, and the 1997 vintage was recently ranked sixth in the Wine Spectator's Top Ten Most Exciting Wines of 2000.